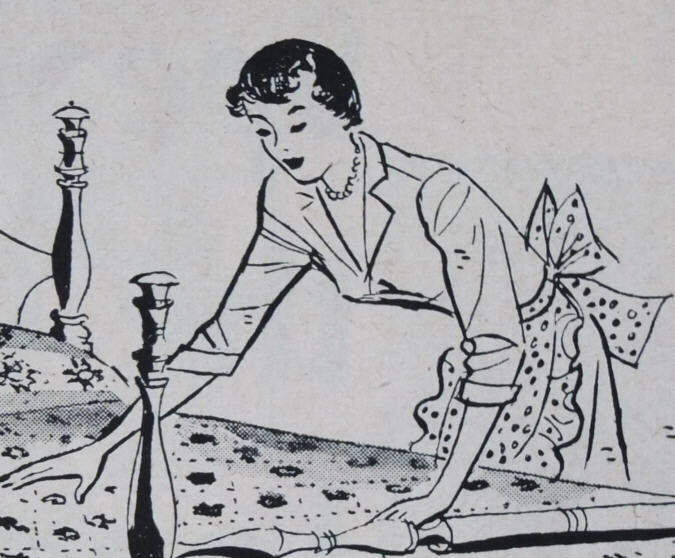 Oh, for the Love of…Vintage Aprons! | Oh, for the Love of Vintage! I recently read somewhere that ‘aprons are a symbol of female oppression’. I find that statement completely ridiculous, but I won’t delve into that. I see absolutely nothing wrong with wearing an apron whether it’s for housework, cooking – or fashion! 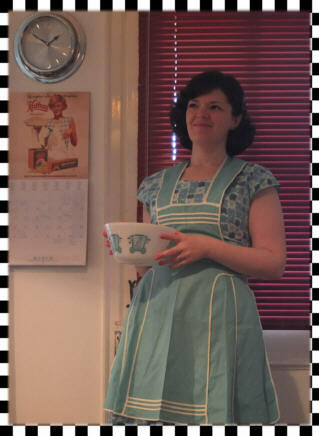 As the title of today’s post suggests, I love vintage aprons. 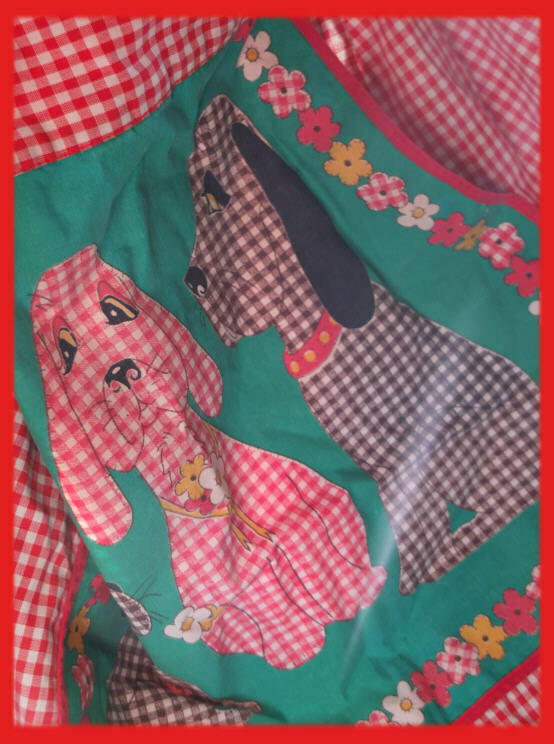 I collect and wear vintage aprons and even design my own vintage-inspired ones. 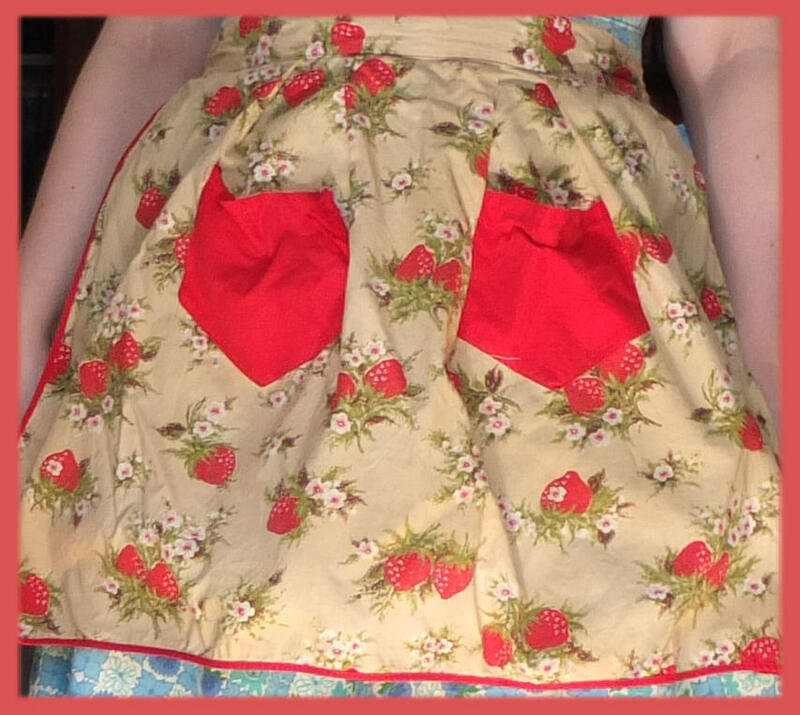 Vintage aprons are pretty and feminine and can really add something special to your outfit. 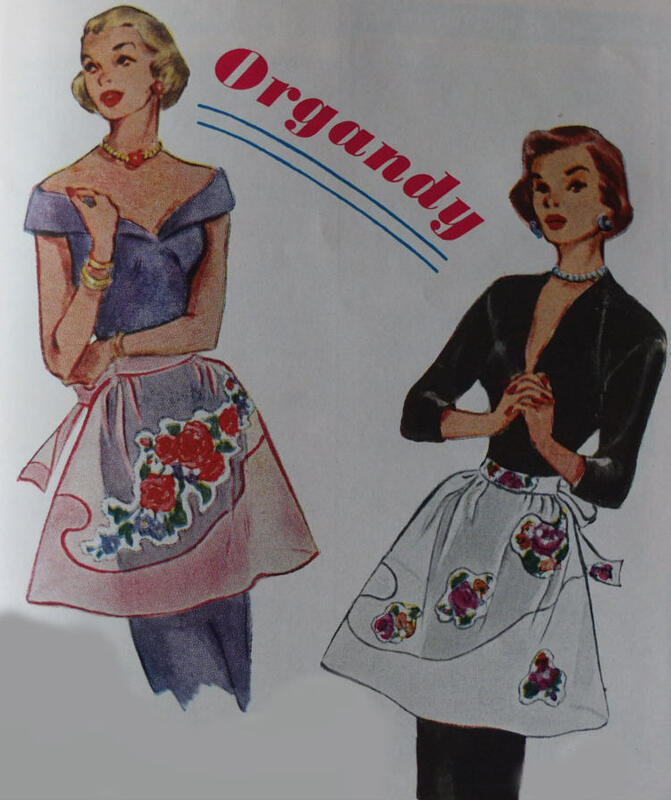 There are many different types and styles of vintage aprons. 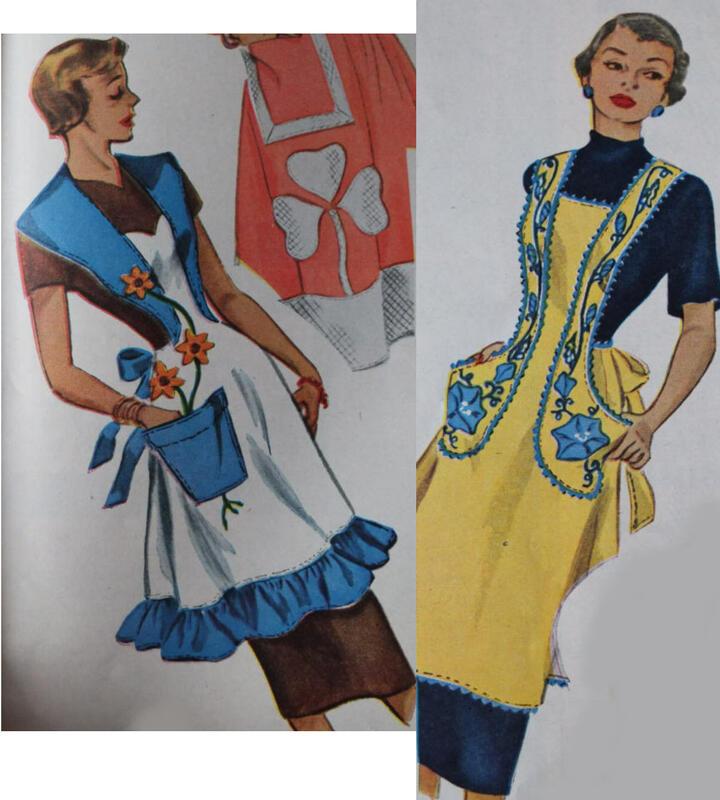 My favourite kinds are full bib ‘hostess’ aprons and half or ‘skirt’ aprons. To clarify, a bib apron is the kind where you do not have to tie it around your next. Called a bib apron after babies bibs, I imagine. Sometimes bib aprons also criss-cross in the back. Hostess aprons refer to full-length 50s aprons that are colourful, ruffly, ornate and sometimes over-the-top. 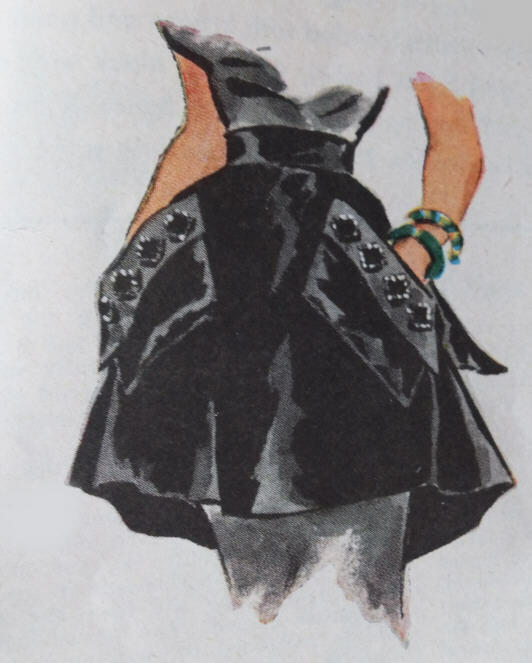 A half (or skirt apron) is half of a full size apron and covers the bottom of your dress or skirt. 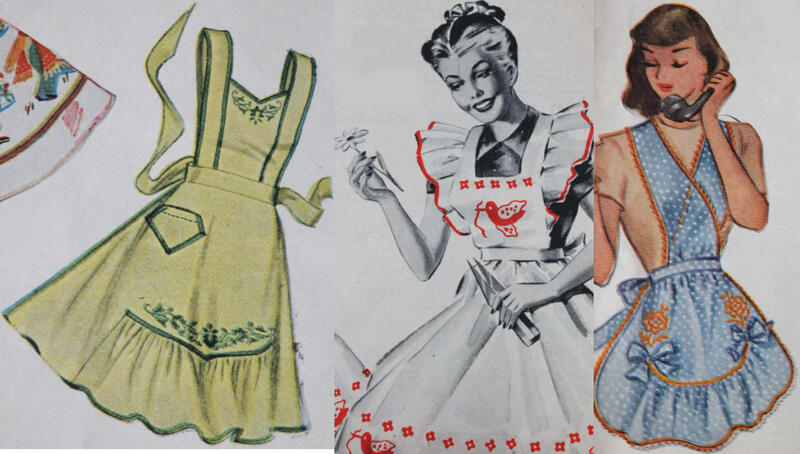 In the 1950s aprons became more popular, but were not just worn to keep clothes clean of dust and cooking debris. 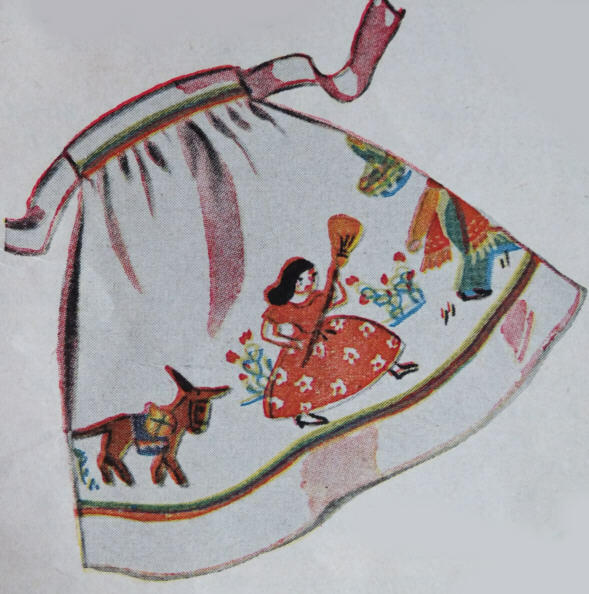 Aprons were worn for fashion and seen as an accessory to an outfit. Elaborate and embellished half aprons were created to complement evening dresses, deemed ‘glamour’ or ‘dress’ aprons. These aprons are more ornate than day aprons and feature intricate embroidery, beading, stencils, tassles – you name it! 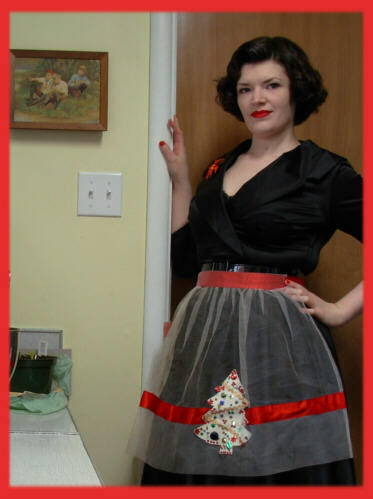 See below one of my dress aprons, worn last year as part of my Christmas eve outfit. 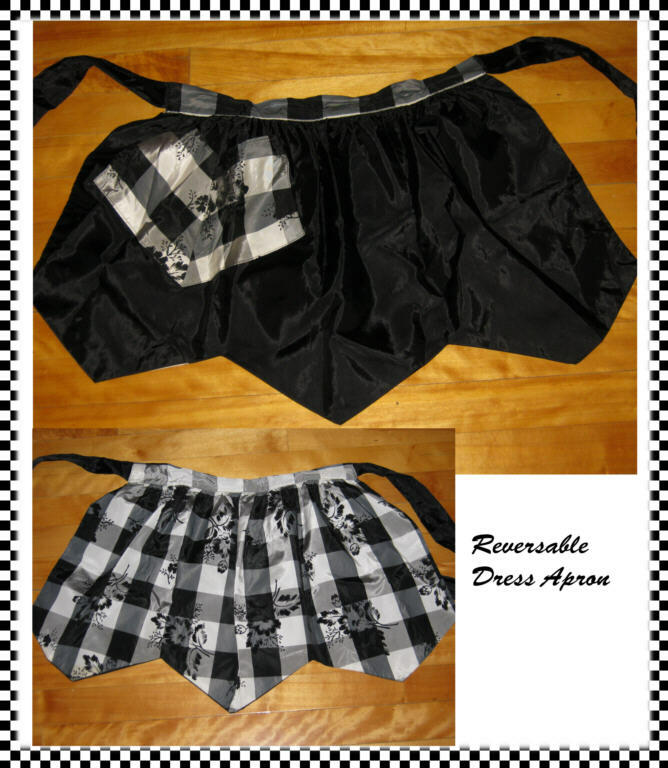 Some of these aprons are so lovely I want to buy them, sew them up the back and wear them as a dress! It is one of my little GUILTY pleasures. 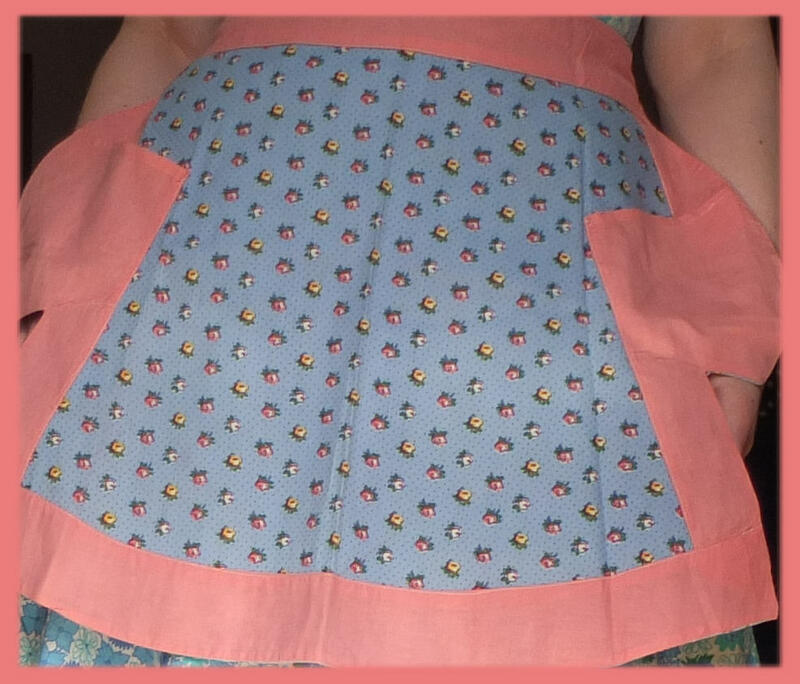 I will tweet you a picture of a cracker I have recently made, its from a vintage pattern and is a full skirted apron, I loves it so much hehe. Hi Frankii and Theadora! Glad you like the post. Oh my, what a wonderful post! Yes I think we share a love of vintage aprons. 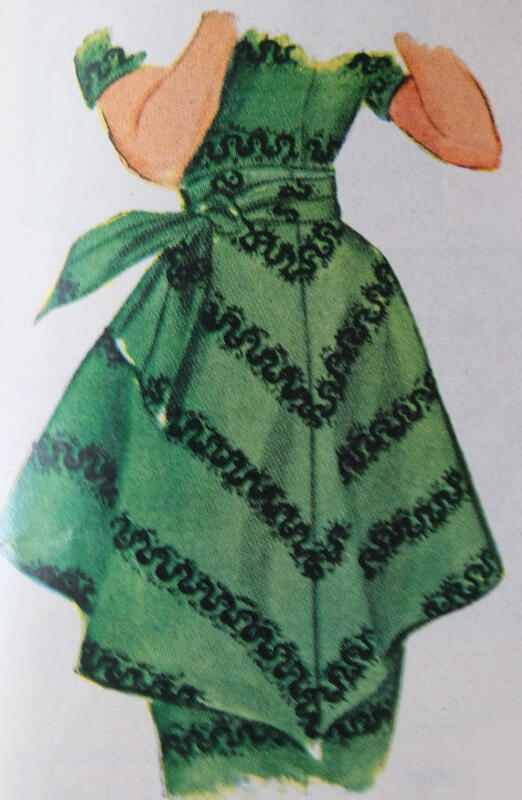 I have tons of vintage apron patterns (I need to find time to make a few) and always pick them up whenever I run across them. I love the bib apron, it is fantastic! Will be following you and thanks for stopping over! 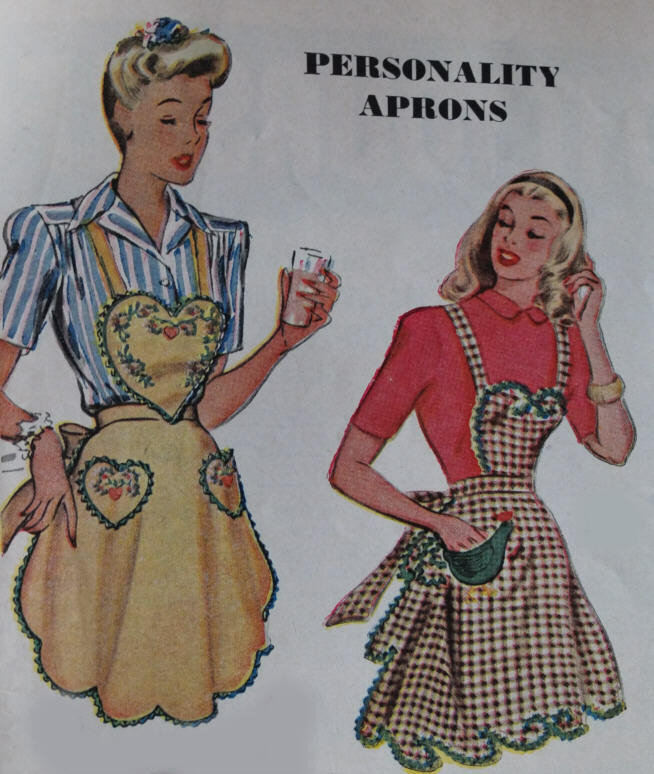 I love looking at others vintage apron collections. I don’t have any apron patterns, but I sure do wish I did! I’d love to see yours. Hi Rachel, glad you like my blog too! 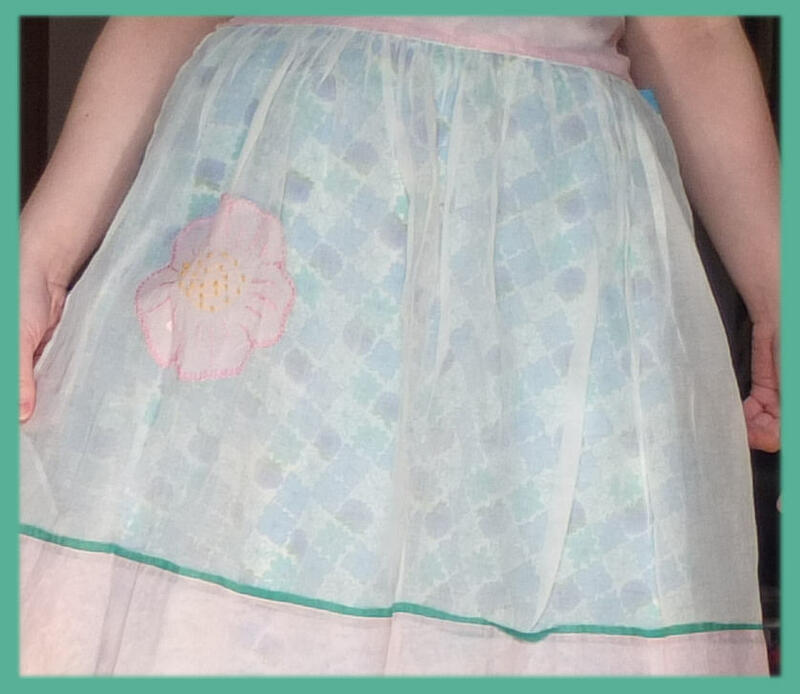 Will you be doing a post about making a pattern from the apron you bought? I’d love to see that! A symbol of female oppression? More like a symbol that we’re smart enough not to ruin our clothes! Love the pic of you in the blue bib apron. Exactly my thinking! Ha ha. ;0 I bet you’ve got some great aprons too! We seem to collect the same things. Pingback: Let’s Get Cooking Chicken Parmesan! « Oh, for the Love of Vintage! As you can see I am a Policeman in london. My wife has been collecting aprons most of her life. She is particuarly keen on collecting half aprons and also ones that advertise. We are always on the look out. Have you any suggestions where to find them in the London area.